AFRICANGLOBE – President Abdel Fattah al-Sisi said Egypt had “rescued” 27 Ethiopians who were abducted in war-torn Libya, as state television showed him greeting the group at Cairo airport on Thursday. It was not immediately clear how the Ethiopians were rescued, or the details of their abduction, but Sisi’s office said the group flown in on an Egyptian plane was “liberated by Egyptian and Libyan security services”. “All efforts were made to bring the Ethiopians to Egypt safely… Egyptian services participated in this effort to protect, rescue and secure our Ethiopian brothers,” Sisi told reporters at Cairo airport. In a separate statement, the army quoted Sisi as saying that the Ethiopians had been kidnapped in Libya. Sisi “hailed… Egyptian efforts to rescue the Ethiopian brothers who were kidnapped in Libya,” during a seminar attended by army and police officers, the military said. The army did not provide details on the circumstances of their abduction. Ethiopia hailed efforts of Egyptian security agencies in rescuing its citizens. 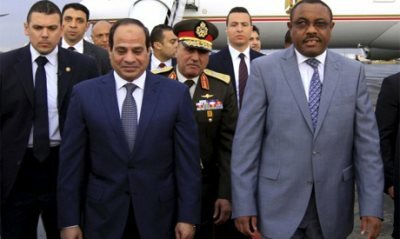 “Such efforts contribute to achieving stability in Egypt as well as in Arab and African countries whose security is linked to that of the Red Sea,” Ethiopian Prime Minister Hailemariam Desalegn told Sisi in a telephone call, according to a statement issued by Sisi’s office. Sisi’s comments come weeks after a purported video released by the Islamic State jihadist group showed the executions of some 30 Ethiopian Christians captured in Libya. He said Egypt was “pained by the gruesome beheading of innocent Ethiopians in Libya” and that the rescued Ethiopians were living in dire conditions in the war-strewn country. “What is happening in Libya is a matter that concerns us and we tell the whole world that Libya should return to be a safe and stable country for its people and even to its visitors,” Sisi said at the airport. Libya has plunged into chaos since the toppling of long-time dictator Muammar Gaddafi, with rival militias fighting for the control of country’s oilfields and territories. The killing of Ethiopians came weeks after the jihadists posted a similar video showing the beheadings of 21 Coptic Christians, all but one of them Egyptians, on a beach in Libya. The killing of Egyptian Christians had prompted air strikes by Cairo targeting IS targets inside Libya. Sisi has repeatedly called for a joint Arab military force to fight jihadists in the region, and at an Arab League summit in March, regional leaders agreed to establish such a force. The details of the joint Arab force have yet to be worked out. Since his election last year, Sisi has been working to improve relations with Addis Ababa amid a dispute over Nile water rights. Ethiopia began diverting the Blue Nile in May 2013 to build a 6 000 megawatt dam, which will be Africa’s largest when completed in 2017. This has raised fears in Cairo that Egypt’s share of the Nile would fall. In March, Ethiopia, Egypt and Sudan signed an agreement of principles on the dam to ease tensions.